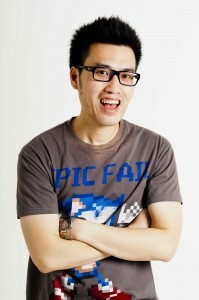 We love visitors here at Aussiereviews, but it’s been a while since we’ve had an author drop by to chat about their latest book – so it’s especially wonderful to welcome Oliver Phommavanh today, here to tell us about his new children’s novel, The Other Christy. Welcome Oliver. My book’s called The Other Christy, published by Penguin Random House and it came out on 13th June. It’s a story about two girls who share the same name in a class and they don’t like each other. But then they discover they have something more in common than just their name. I love writing about weird or awkward characters and I have this fascination as a teacher and author of seeing unlikely friendships form. I also had this voice of a shy girl with loud ideas in my head for awhile, just waiting to be unleashed. I wasn’t sure about how deep to delve into Christy’s family and her Cambodian background. Christy’s grandpa lived through war with the Khmer Rogue and he carries a lot of emotional scars. It was tricky at first but I found the right balance with sharing some insightful moments with some light-hearted humour. Christy’s passion is baking so she creates a lot of sweet treats. I tried to bake with my wife, and made brownies, cupcakes and cookies. Research never tasted so good. I went to Cambodia last year to visit the war memorial and genocide museum in Phnom Penh. I was absorbed with all of the personal recounts and stories, and was determined to shed a little light on that in my book. I’ve just finished a whirlwind promotion tour with my publicist across three states and doing a blog tour now. I’ll continue to talk about The Other Christy at various festivals for the rest of the year. I’m working on the sequel to Con-nerd, called Super Con-nerd. Hopefully it’ll come out in March 2017. Thanks for visiting Oliver. If you want to find out more about The Other Christy, you can visit the other stops on Oliver’s blog tour. And you can see my review of The Other Christy here. A long time ago a duck sat on her nest, waiting for her eggs to hatch. The sun was shining and all the other ducks were swimming in the water. Mother Duck wanted her eggs to hatch so she could enjoy the sunshine. She didn’t have to wait for long. One by one, the eggs hatched. Everyone admired Mother Duck’s four little ducklings. They ran around in circles. ‘Quack quack quack!’ they said. When Mother Duck’s eggs hatch, four of her babies are beautiful yellow and quack just like her. When her final egg hatches, long after the others, she discovers ‘quite the ugliest duckling she’s ever seen’. Instead of ‘quack’, this ‘duckling’ honks. None of the other animals know quite what to make of this newcomer. The rabbits are scared, the hens laugh and the cows chase him around the paddocks. Even his nest mates shun him. When Mother Duck takes her babies for a swim, Ugly Duckling walks away. He tries without success to find a new home, until he happens upon some baby swans. They welcome him, as does their mother. Illustrations are pencil and watercolour, in soft colours. Endpapers feature Ugly Duckling and ducklings. The Ugly Duckling is part of a new series from New Frontier Publishing called Happily Ever After. The story is simplified for a young audience and presented as hardcover picture book, with large text and only a few words on each opening. Illustrations are gentle even when Ugly Duckling is outcast. After a few readings, preschoolers will be able to ‘read’ it for themselves. The sun is up and I have a lot to shoe. No. I have a lot to poo. No, no, no. I have a lot to do. I’m going out and my dag is coming with me. Clarrie is a farmer, who has things to do in town. He also has a bit of trouble with words – getting the right ones, that is. He wants to take his dog but Bert can’t be found. So Clarrie sets off without him. His day in town is full of tasks, from having morning tea, through getting new footwear to acquiring some new farm animals. But disaster strikes on the way home and perhaps Clarrie and his purchases may not make it. Clarrie and his chickens will need help if they are going to make it home. Illustrations use many mediums (acrylic, watercolour, ballpoint pen, grey lead and collage) and are set in white space. The font is handwriting-like and the mixed up words are presented letter by letter as if they have been torn from a newspaper or other source. 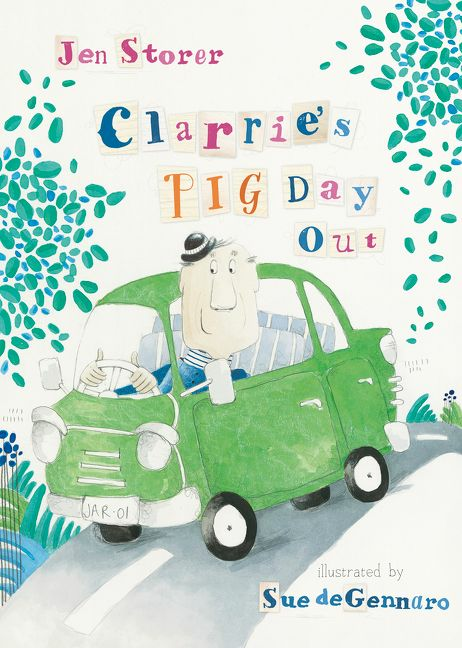 Clarrie’s Pig Day Out bumbles gently along though a day in the life of farmer Clarrie. The language is poetic and funny, the illustrations an ongoing chuckle. The word substitutions will set the reader giggling. Readers can spot Bert when Clarrie cannot, and find the other animals who populate the farm. Clarrie’s Pig Day Outoffers the opportunity to play with words, while subtly introducing meaning and variety to vocabularies. A hoot to read out loud, sure to be enjoyed by pre- and early-schoolers. Ours must be very old. from when she was young. TThe Dreaming Tree is a collection of poems about Australia, contemporary and historic. From gum leaves to prawning, landscape to frost, this collection covers a wide range of subjects. There are poems as old as the land and as new as children playing. A note at the end suggesting readers write their own poems, using their world as inspiration. Each poem is accompanied by illustrations, each spread sets the image as if it were a photo in an album. The background is ‘stained’ and ‘torn’. Poetry is like a snapshot, a photo taken to catch a single moment, a single idea. This collection is set out like an old photo album, perhaps suggesting that each poem is ageless, timeless. Jo Oliver suggests that poems have no rules, and while there are those who would disagree, it’s a great way for children to begin writing. Freeing young writers from the assumed obligation to rhyme removes one level of challenge and hopefully will inspire them to ‘have a go’. Individually, these poems look at single ideas, together they offer a starting place for viewing Australia and Australians. Recommended for primary readers and for educators wanting examples of nature poems. It’s time for bed, sleepy head. No, no, take RED instead. It’s bed time, but a small child is resisting. But in the interests of helpful, other options are offered to Mum. Each of these options rhymes with ‘head’. Each introduces other occupants of the house, other aspects of the life of this particular family and their neighbourhood. Finally, Mum suggests that Ted might be lonely if he is in the bed alone. This provides the trigger for a final trooping upstairs to bed. Illustrations are pencil and watercolour and offer their own narrative and extra elements to identify. Endpapers feature a paper plane flying and landing, and other elements of the child’s life. Take Ted Instead is a bedtime story. A story of bedtime that is, full of the procrastinations many young children employ to delay the inevitable. It’s not that bed is an unwelcome place, just that staying up seems a more attractive option. Here, the procrastination takes on a playful tone with each of the offered alternatives rhyming with ‘head’. A young pre-reader will soon be able to make guesses about the ‘head’ rhyme on the page. Recommended for preschoolers. My mum has secret superpowers. Told in the first person, a child offers some Mum-based superpowers. Mum transforms with each superpower, from X-ray vision to mindreading. 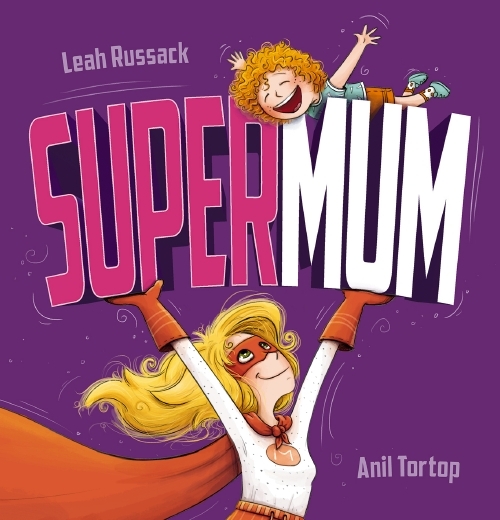 Mum is a whole range of superheroes not just one. Only in the final page, does she revert to her original form for the best superpower of all. Illustrations are loose, humourous and colourful. ‘How about we go and find out sometime, kid? Well, some time came and some time went, and I was ready to go looking for the source of the river … or at least I thought so. Clancy and Uncle Egg are off on another adventure. This time, they’re off to seek the source of the Glenelg River. Clancy is ready to go, but discovers that first he has to do some preparation. Fortunately, Uncle Egg knows just what to do, and Clancy is soon in training. Then they plan what has to go in each of their backpacks, before setting off in the train to Gariwerd (Grampians) in Western Victoria. Their hike takes them up and down hills and mountains and includes plenty of adventure, both expected and unplanned. In addition to the narrative, local fauna and flora are identified throughout and in the endpapers, both in local languages and in English. Indigenous and colonial history are both explored. 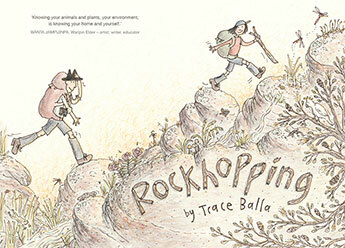 ‘Rockhopping is an 80-page graphic novel, wrapped in a picture book hardcover. Clancy and Uncle Egg’s first outing, canoeing along the Glenelg River, is detailed in ‘Rivertime’. Rockhopping sees the pair searching for the source of the same river. They know where to look for it, but looking and finding are different things. It’s very clear that the joy is in the journey as much as – if not more than – the destination. Trace Balla fills her pages with adventure and knowledge. Clancy, the viewpoint character is a primary school student, and embodies a wonderful blend of openness, innocence and knowledge. He is happy to learn from his uncle and others they encounter, but he’s also developing a calmness and resilience and some great problem-solving skills. Rockhopping is a rich, accessible delight. Highly recommended for mid-primary plus. A baby kookaburra and mother begin the day early, singing to the sunrise. The pair move through the day together, mother caring for and teaching her baby. Each activity they share is accompanied by the sounds these activities might make, eg flying ‘across the cloudy sky. Swoop, Swoop, Swoop’. When Mama kookaburra reveals a final secret, Baby kookaburra offers one too. Illustrations are stylised and full of bright, engaging colours. Endpapers offer a colourful night sky and suggest the cycling day and night. Baby kookaburra makes statements about his world and his learning on the left page of each opening and questions are held for the right-hand page of each spread. This structure encourages speculation about what the answer will be and how it will be answered. Listeners are offered the opportunity to join in the movement sounds, and/or act them out. 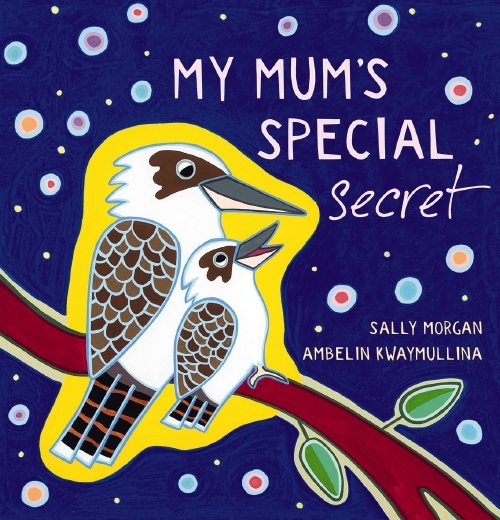 My Mum’s Special Secret is pitched for pre-schoolers and offers information about an iconic Australian animal wrapped up in the relationship between a parent and a child.